Man Ray was an artist of enormous international standing, who worked in many media including photography. He began to make rayographs when he moved to Paris in 1921. 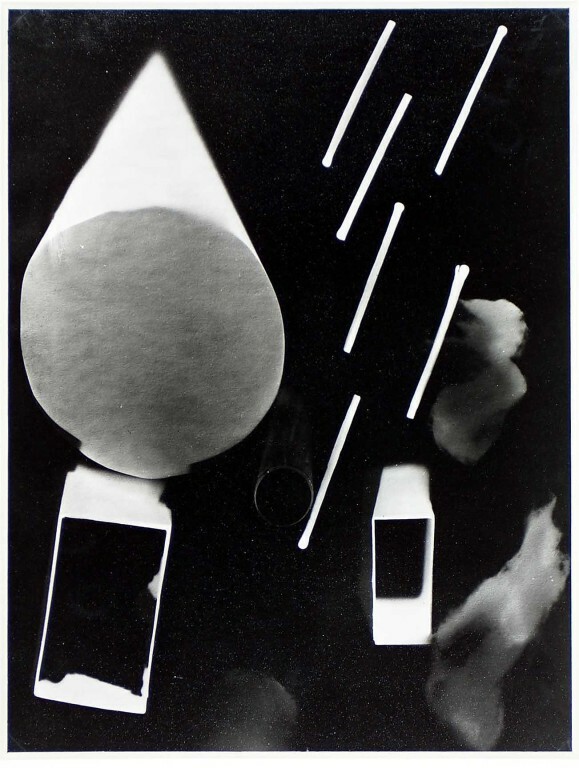 Rayograph was Man Ray's name for photogram, a type of photograph made without a camera or a lens. 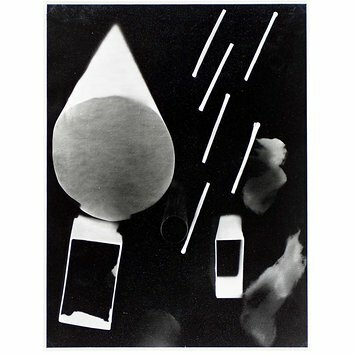 To make photograms, objects are placed onto light-sensitive paper and then exposed to light. The light areas of the print are where objects have rested on the paper and stopped light exposing the paper. This technique appealed to Man Ray because the process was automatic, and this fitted into Surrealist thought and practice. It represents ordinary objects in an ambiguous way, capturing their forms and shadows rather than describing their structural or tactile qualities. Almost flat objects (such as the matches in this image) appear as almost flat forms, but where the shadow is shown, as with the matchbox, the object is not so easily recognisable. By concentrating on the play of light and shadow, the most familiar of everyday objects take on a strange and unexpected character. Black and white abstract photograph showing the outline forms of matches and matchboxes. Man Ray was an artist of enormous international standing, who worked in many mediums including photography. He had started to use a camera in order to make good reproductions of his paintings and would in later years take photographs of friends’ work including Duchamp, Picasso and Braque. He was living in New York in the 1910s and had some contact with Stieglitz and the ‘291’ gallery but it was not until he moved to Paris in 1921 that photography became a dominant form for his ideas. Man Ray had some contact with Dada and Surrealist thinking and art while in New York. Marcel Duchamp had moved to New York in 1917 and the two men collaborated on photographic work. Man Ray started making ‘rayography’, named after himself, when he moved to Paris and was also using other techniques such as solarisation and compound printing to produce Surrealist portraits and still lifes. By the mid-1920s Man Ray was also a popular and well paid fashion photographer for Vogue and Harper’s Bazaar. Surrealism was by that point not only a literary and visual avant-garde movement but also a visual style used in commercial graphics. Man Ray had a large studio in Paris and employed young assistants during the 1920s, including Bill Brandt, Berenice Abbott and Lee Miller. He left France for America in 1940, returning to Paris in 1951. He took decreasing numbers of photographs in his later years, but his photographs along with other work were frequently on exhibit throughout the world up to his death in 1976. Attribution note: A rayograph (or photogram) is a type of photograph made without a camera or a lens. Objects are placed onto light-sensitive paper and then exposed to light. The paper is developed and fixed after exposure. The light areas of the print are where objects have rested on the paper and stopped light exposing the paper.